With a sophisticated yet relaxed atmosphere, Al Muntaha (meaning �the ultimate�) most certainly lives up to its name. Suspended two-hundred meters above the Arabian Gulf, at the top of the deluxe Burj al Arabhotel this elegant venue is truly a special place to dine. 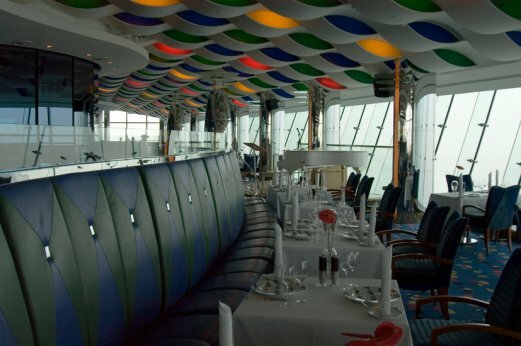 Service is immaculate and the slanted glass windows give the restaurant the feel of a great ocean liner heading out to sea. The views of the Arabian Gulf and coastline are as superb as the fine Mediterranean cuisine served up by executive chef Jean Paul Naquin. Try the Souffle with pumpkin seeds, tapenade and Parmesan crackers or the divine dover sole, which arrives skinned, partially filleted and artfully presented on a bed of champagne risotto, two exemplary expressions of the modern European cuisine served up here. Al Muntaha is a fine dining experience to equal any in the world, with it�s glitzy, art deco interior, breathtaking views and splendid modern eclectic fare it�s a sure-fire hit.